SignalFx is an example of a cloud based analytics service. SignalFx provides a REST API for uploading metrics and a web portal that it simple to combine and trend data and build and share dashboards. This article describes a proof of concept demonstrating how SignalFx's cloud service can be used to cost effectively monitor large scale cloud infrastructure by leveraging standard sFlow instrumentation. SignalFx offers a free 14 day trial, making it easy to evaluate solutions based on this demonstration. The diagram shows the measurement pipeline. Standard sFlow measurements from hosts, hypervisors, virtual machines, containers, load balancers, web servers and network switches stream to the sFlow-RT real-time analytics engine. 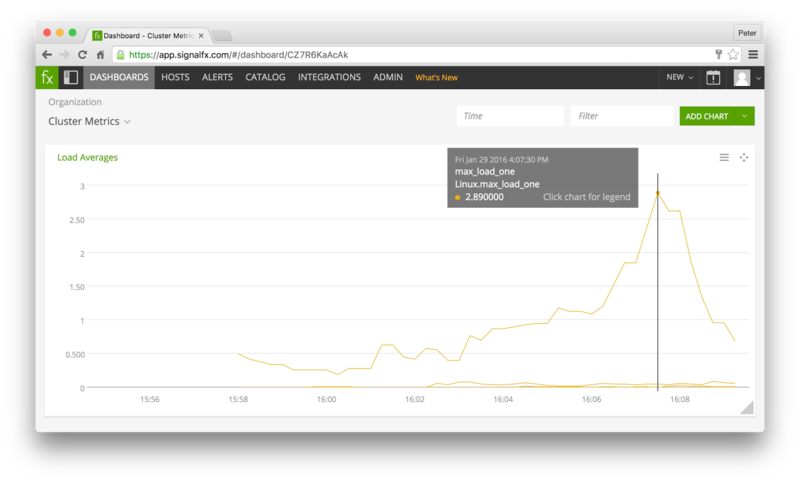 Metrics are pushed from sFlow-RT to SignalFx using the REST API. Over 40 vendors implement the sFlow standard and compatible products are listed on sFlow.org. The open source Host sFlow agent exports standard sFlow metrics from hosts, virtual machines and containers and local services. For additional background, the Velocity conference talk provides an introduction to sFlow and case study from a large social networking site. SignalFx's service is priced based on the number of data points that they need to store and they estimate a cost of $15 per host per month to record comprehensive host statistics at 10 second granularity. Collecting metrics from a cluster of 1,000 hosts would cost as much as $15,000 per month. First register for free trial at SignalFx.com. Now start sFlow-RT. Cluster performance metrics describes the summary metrics that sFlow-RT can calculate. In this case, the load average minimum, maximum, and quartiles for the cluster are being calculated and pushed to SignalFx every minute. Metrics should start appearing in SignalFx as soon as the Host sFlow agents are started. In this example, sFlow-RT is exporting 5 metrics to summarize the cluster performance, reducing the total monthly cost of monitoring the 1,000 host cluster to less than $15 per month. Of course there are likely to be more metrics that you will want to track, but the ability to selectively log high value metrics provides a way to control costs and maximize benefits. A network connecting 1,000 physical hosts would have considerably more than 1,000 switch ports and summarizing the per port statistics greatly reduces the cost of monitoring the network. For a catalog of network, host, and application metrics, see Metrics.